Flax seeds have a long and extensive history. Flax is grown both for its seeds and for its fiber. Various parts of the plant have been used to make fabric, dye, paper, medicines, fishing nets, hair gels, and soap. Flax seed is the source of linseed oil, which is used as edible oil, as a nutritional supplement and as an ingredient in many wood finishing products. They are nutty yet pleasantly sweet in taste. Flaxseeds contain nutrient load packed with omega 3 fatty acids and fiber. Flax seed`s nutrition facts are impressive. Besides containing antioxidants, lignans and other nutrients, it`s a valuable source of omega-3 essential fatty acids. Flax seed is a good source of magnesium, copper, phosphorus, and fiber. Omega 3 fatty acids present in flax seeds are comparable to the quality of fats in fish. 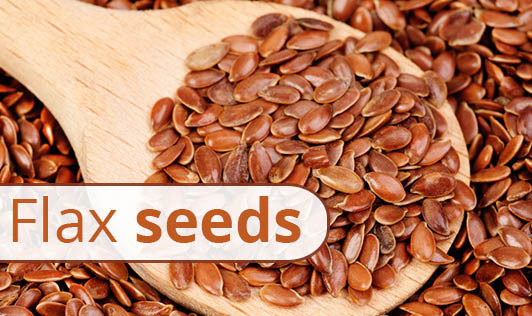 Flax seeds are one of the best vegetarian sources of fat in your diet. Omega- 3 content in these flax seeds is ideal for those seeking to reduce total cholesterol levels and improve their HDL level (good cholesterol). Myth: Does consumption of flax seeds leads to cyanide poisoning. Fact: Flax contains very small amounts of cyanide compounds. Heating, breaks these compounds down. However, our bodies have a capacity to neutralize a certain amount of these compounds . Myth: Whole flax seeds are more nutritious than ground flax seeds. Fact: : Whole flax seed is not beneficial to the body as ground flax seeds. Ground flax seeds have better absorption compared to whole flax seeds. Add a tablespoon of ground flaxseeds to the breakfast cereal. Add a teaspoon of ground flaxseeds to dosa or chapati dough, mixed vegetable rice, dry chutney powder, salads. Mix a tablespoon of ground flaxseeds into yogurt and eat it as a snack. Add ground flaxseeds into cookies, breads, biscuits and other baked foods.